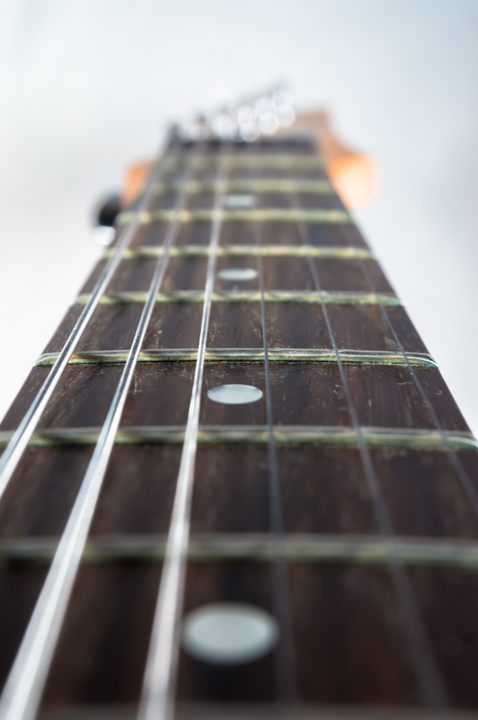 A macro shot of the neck of an electric guitar. The physics of music is a broad and fascinating topic. Perhaps the most important concept, however, is the relationship between pitch and frequency. By definition, frequency is the number of times a repeating event occurs per a unit of time. It is typically measured in hertz. Since we're talking about music a common example is the "standard tuning" of instruments at 440 Hz. In terms of pitch this is what we call A4. So that means that for a concert violin to be "in tune" when it plays the A string it should vibrate at 440 Hz. What this means is that the string will vibrate back and forth 440 times in 1 second. That's a lot of vibration! The vibrations of the string vibrate the air molecules around the violin which propagate through the air to your ear. The mechanics of your ear can be saved for another post, but for now just know that this vibration is then picked up by the cochlea (in the ear) which converts the vibration to an electrical signal that gets sent to the brain where it is interpreted as pitch. If we wanted to change the frequency of a vibrating string we can change the strings length, its tension, or the strings density. For the sake of being able to easily play the instrument, a guitar has strings that are all the same length. In the case of a stratacastor they are usually 648 mm long. This is why the strings of the guitar need to be different thicknesses (thus having different densities) in order to achieve different frequencies. This determines the lowest possible frequency producible by that string but then the musician can play around with the variables by altering the string length and they are playing. This is of course done by pushing the string down on a fret. The string is shorted and the frequency produced goes up. The A string of a guitar is 2 octaves below the A string of a violin, which again is tuned to 440 Hz. If we divide that twice (once for each octave) we get 110 Hz.